This week on the blog I’m celebrating works by the famous turn-of-the-century Catalan architect Antoni Gaudí, who designed everything from churches to mansions to public parks. This post is the second in a seven-part series; check out the introduction here! Pronounced “buhl-YOE” [bəʎˈʎo], Casa Batlló was my favorite of the Antoni Gaudí-designed residences I got to visit in Barcelona last year. A wealthy textile industrialist named Josep Batlló had purchased Passeig de Gràcia Nº 43 but was unhappy with the house’s design, so in 1904 he commissioned Gaudí to do something about it. By 1906, the architect had completely remodeled the townhouse in his signature style. The front façade offers a way to appreciate Gaudí-style buildings for free. From a distance, the house appears a rather drab bone-gray, but upon closer inspection, faint bacterial colonies of red, green, purple, and blue tiles emerge that bring the façade to life even as the weird balconies and windowpanes whisper a subliminal message about skeletons. Whenever people mention Casa Batlló—nicknamed the “House of Bones”—they always mention that Gaudí basically tried to avoid incorporating any rigid, straight lines. Maybe, but perhaps this is just what happens when you draw all your inspiration from the sea and underwater life? I don’t think the architect purposefully omitted straight lines and right angles, but merely copied the organic, smooth forms found in nature. From the very entrance you get the impression you’re under the sea: the foyer walls are decorated in scale- or bubble-like patterns and a groovy banister looks like the “lips” of a giant clam. Above, on the so-called Noble Floor, you’re led into a large drawing room with a toothed ceiling lamp made to look like either a whirlpool or a nautilus shell, and the vast street-facing window is decorated with blue and pink stained glass circles—or should I say sand-dollars, sea urchins, and plankton? My tour through the house put me in a calm, relaxed mood, just as tidewaters can have a healing, soothing effect. 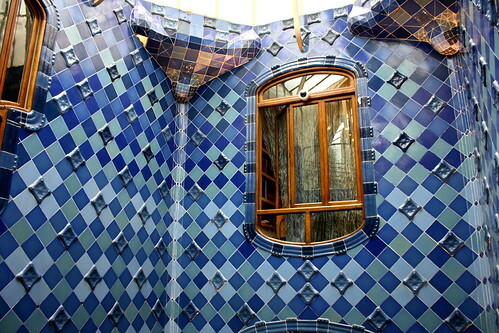 The audioguide pointed out an ingenious feature of the house’s lightwell, or inner patio/gap that brings light to interior rooms: to ensure an even distribution of light at the upper and lower floors, Gaudí graded the tiles so that darker, light-absorbing blues float above and paler, light-reflecting blues dominate below. Gill-shaped windows are narrow on the top floor and gradually expand to take in more air the farther down you go. The roof is, like all Gaudí houses, pretty cool, but the attic is equally fascinating. You walk through a colonnade formed by dozens of white, plaster upside-down catenary curves (think the St. Louis, Mo., Gateway Arch). 1960s-like in their pale minimalism, you begin to wonder if you’re slipping past the ribs of a sardine skeleton. Emerging from the ethereal tidal pool, you walk out onto a clean, spacious terrace. The architect grouped the house’s many chimneys into four clusters, but the chimneys look less like sooty smokestacks than deepsea tube worms, or frozen-in-time backup dancers swaying to rhythms, rhythms that could be the regular crashing of waves or the coming and going of the tides. And capping it all is a sharp mound, festooned with lumpy blue and brown scales shingles and bookended by a cross-bearing turret. You might say it resembles a coelacanth, the body of a coastal bird, or even a dragon. Gaudí was a very devout Catholic, and the patron saint of Cataluña is St. George (Sant Jordi). 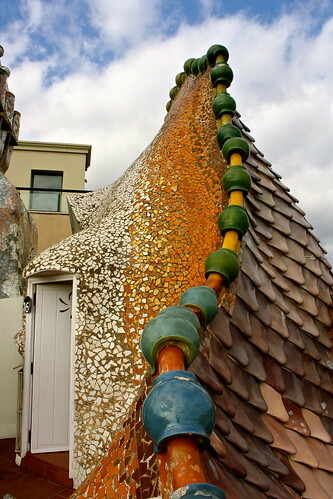 Since St. George, according to legend, slew a dragon and saved a damsel, it’s thought that Gaudí inserted this regional symbol right onto the house: the ridged spine of the lizard drapes over the façade while the gleaming white cross-topped tower represents the piercing spear of St. George. How to get there: Casa Batlló is house Nº 43 on the west side of the Passeig de Gràcia (Eixample district). Take the L2 (purple line), L3 (green line), or L4 (yellow line) on the Metro and get off at the Passeig de Gràcia stop. 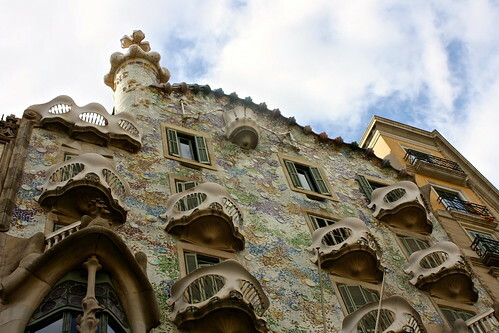 If you’ve ever traveled to Barcelona before, did you get to take a peek inside Casa Batlló? Comment below!